Rememeber the last time you used one of those basic, point-and-shoot cameras? It must have been a while if you own a _phone_ with a good camera on it. That's the case for millions of folks and it comes as no surprise – most modern high-end smartphones take quality photos, as our numerous camera tests and comparisons have shown. Today we bring you another of our camera comparisons, and the star of the show is the Samsung Galaxy Note 4. It is a _phone_ with plenty of potential as far as photography is concerned – with a 16MP snapper and optical image stabilization, it impressed us greatly when we took it through the review hurdles. Our readers favored it as well in a recent blind camera comparison. Now, however, will it stand its ground in a full-on camera comparison against 6 other heavyweights? We've chosen to compare the Samsung Galaxy Note 4 against some of its biggest rivals, including the iPhone 6 and iPhone 6 Plus. We've also invited the Sony Xperia Z3 and the LG G3 to the party. In addition, we feel obliged to put Samsung's own Galaxy S5 and last year's Galaxy Note 3 in the ring as well. Here's what all these phones have to offer in terms of specs. As we know from experience, Samsung's recent phones have this general tendency of producing images with a colder color tone. The Samsung Galaxy Note 4, however, is rather different. Color accuracy in its images is spot-on, with colors being neither warm, nor cold. Also, the sky's shade of blue, which is usually hard for a smartphone camera to represent faithfully, is reproduced very close to its real-life hue. As far as saturation goes, colors are vivid, but not overblown. 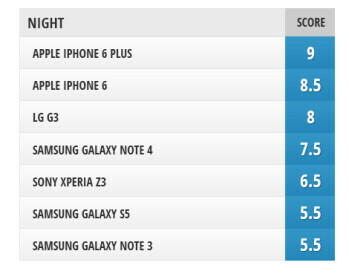 Hardly a surprise, the iPhone 6 and iPhone 6 Plus perform well in this category. Like the case is with the Note 4, colors in their images are lively and eye-pleasing, but never too saturated. We're noticing a slightly warm tone in them – it is more pronounced in some scenes, but barely noticeable in others – but we're okay with that slight imbalance. Photos from the Galaxy S5 and Note 3 exhibit a slightly cold-ish tone, but this is only noticeable in some of the photos that we took. Color saturation is slightly boosted, giving the images a more lively look. Similarly, a colder tone is noticeable in the LG G3's images, but it tends to be a bit more pronounced. Whether you'll notice it or not depends on the kind of scene. Either way, it isn't likely to bother you, unless you're very picky about image quality. The Sony Xperia Z3 has a somewhat different approach to color reproduction. Colors in its photos are neutral to washed out, and we find them lacking in saturation. There's a coldness to them as well. Rememeber the last time you used one of those basic, point-and-shoot cameras? It must have been a while if you own a phone with a good camera on it. 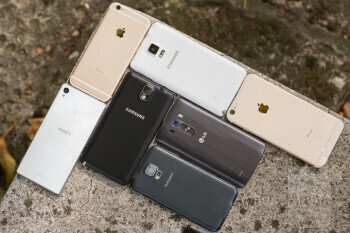 That's the case for millions of folks and it comes as no surprise – most modern high-end smartphones take quality photos, as our numerous camera tests and comparisons have shown. Today we bring you another of our camera comparisons, and the star of the show is the Samsung Galaxy Note 4. It is a phone with plenty of potential as far as photography is concerned – with a 16MP snapper and optical image stabilization, it impressed us greatly when we took it through the review hurdles. Our readers favored it as well in a recent blind camera comparison. Now, however, will it stand its ground in a full-on camera comparison against 6 other heavyweights? Once again, the Samsung Galaxy Note 4 delivers impressive results without even trying hard. Its photos are extremely detailed, and their high resolution allows us to zoom in closer on areas of the frame. Even minute details like the cars' license plates and leaves on trees are easily distinguishable. There is some slight digital noise seen around edges, but its presence isn't disturbing. We'd rank the Galaxy S5 a step behind the Note 4, as far as details are concerned – its images are almost as detailed, but finer details aren't as distinguishable as they are on the Note 4. Noise amount is as low as it is on the Note 4's images. Looking at the Note 3's images, we'd say it is holding up well for a last-year's model – its photos are high on details and low on noise. Still, it can't output as much detail as the Note 4 or S5, especially when you take a closer look at finer details. The LG G3 takes photos with softened details. Noise is low as a result, but fine details appear smeared – the further you zoom in, the easier this phenomenon is to notice. Photos aren't bad by any means, but don't expect them to look splendid from up close. Again, the iPhone 6 and iPhone 6 Plus are at the same level when it comes to details. Given the 8MP of resolution their cameras have to offer, we're impressed to see how much detail the snappers can resolve. Still, they're no match for the Note 4, at least not in this category. The Note 4's indoor photos are anything but disappointing. Well-lit scenes are detailed, with accurate colors, and low-light ones maintain a good balance between detail and digital noise. When the LED flash is used, however, there's a very high chance of ending up with a cold-looking image. Still, the light produced by the LED is sufficient to fill the entire frame. As long as you're not too far, that is. Overall, the iPhone 6 is about as good as the Note 4 when it comes to indoor, low-light photos. Although some variations may occur, depending on the light conditions – in the presence of a strong light source, Apple's smartphones may produce a brighter, more vivid image, while the Note 4 would not expose the scene as much and may even introduce more digital noise. On the other hand, the Note 4 is likely to capture more detail than the iPhone 6 thanks to its bigger, higher-res sensor. In dim light, the iPhones and the Note 4 are neck and neck, both keeping noise under control and details at a sufficient level. In darkness, the iPhone 6 has the upper hand with their true-tone LED light, which allow it to produce a more natural illumination. Shooting with the iPhone 6 Plus produces great images. 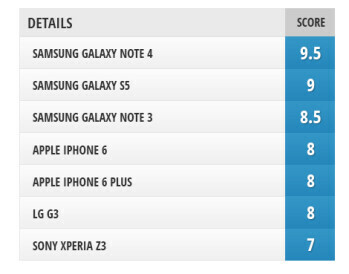 In fact, we'd rank them slightly higher than those from the Note 4 and iPhone 6. In brighter scenes, a difference is hard to spot, but in darker ones, there's more detail and less noise. Again, the true-tone LED light on the 6 Plus produces a strong, natural-looking light illuminating the entire scene. This time around, our Samsung Galaxy S5 delivered decent indoor photos. There's a good amount of detail in them, and colors are accurate as long as the light conditions are favorable. In dim lights, however, color accuracy is noticeably lacking. That is especially true when the phone's LED light fires as it throws the whole image to the cold side. 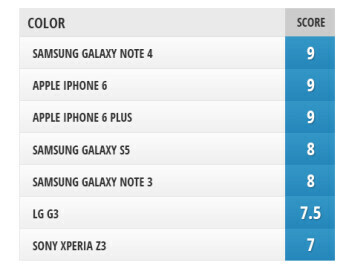 Similar were the results we got from the Galaxy Note 3. Quite often, the phone messes up the color accuracy when the light isn't sufficient and the LED light is used. Details are sufficient, but not captured as precisely as the Galaxy S5 can. As for the LG G3, the phone can be a reliable indoor shooter only if you have enough light. With dimmer scenes, we got awkwardly inaccurate colors and softened details. The dual-tone LED light, however, shines with a bright, natural light and really comes in handy. And lastly, we were underwhelmed by the indoor performance of the Sony Xperia Z3. Its LED light seems too weak to fill the whole frame with light and produces a cold tone when fired. Well-lit scenes look okay, on the other hand. Night scenes is where the Samsung Galaxy Note 4's optical image stabilization has the chance to shine. And while the night photos we took didn't turn out bad at all, we were hoping to achieve better results. You see, the phone likes to set the exposure rather high, which has its pros and cons – dark areas are visible, but brighter ones are “burned out” as a result. Details are preserved fairly well, as long as the area you're looking at is not too close to a light source, in which case they might be overwhelmed by the light's halo. Noise is apparent, but its levels are typical considering the light conditions. In contrast, the iPhone 6 sticks to a darker exposure, and the produced images appear more natural than the Note 4's. There's a pretty good amount of details visible when you zoom in, and digital noise isn't very noticeable. The iPhone 6 Plus performs even better. Its optical image stabilization lets it take images at lower ISO levels and longer exposures, which results in less noise in low-light photos. Also, you'll be treated to pretty clear, blur-free details once you zoom in. With the LG G3, night photos turn out splendid. The phone's OIS camera setup keeps the frame very steady and filters out potential motion blur caused by shaky hands. Details are, again, quite soft, but they look pretty decent given the shooting conditions. The finest of details, however, are not as pretty. The Sony Xperia Z3 takes mediocre night photos. Some do turn out fine, others exhibit colors that are off the right balance. Details are lacking compared to what we saw from the aforementioned phones. The Samsung Galaxy Note 3 and Galaxy S5 could not impress us either. Their night photos are usable if you're not too picky, but are spoiled by blur and noise which are clearly visible once you zoom in even a bit. Pretty much every recent smartphone has the ability to take sweep panoramas. The Samsung Galaxy Note 4, in particular, turns out to be pretty good at it, just like previous high-ends by Samsung. Its panoramas are flawlessly stitched and with tons of detail, as you can clearly see below. Plus, their resolution of 60MP gives you plenty of freedom for cropping, zooming, and printing. The iPhone 6 and iPhone 6 Plus have the ability to take panoramas of over 40 megapixels and stitch them really well. Details, however, aren't as plentiful as they are in the Note 4's panoramas. 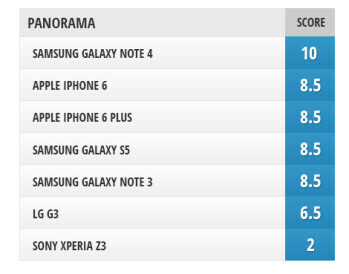 The Samsung Galaxy Note 3 and Samsung Galaxy S5 are are about the same level when it comes to panorama performance. The produced images are of resolution around 60MP and contain little to no stitching imperfections. From the LG G3 we got panoramas with extremely high resolution – around 68 megapixels. The image quality, however, was not as great as the pixel count. Details were muddy and portions of the frames had stitching errors. As for the Sony Xperia Z3, its panoramas are embarrassingly bad. The otherwise high-end phone takes pathetic, 5MP panoramas with no fine detail in them whatsoever. The Samsung Galaxy Note 4 continues to amaze us with its camera. It takes smooth and stable videos, as it turns out, with tons of fine details in them. Shakiness is reduced to a minimum thanks to the optical image stabilization. Night-time videos are noisier, of course, but still very fluid and pleasant to watch. Sound in videos is of good quality and neither too loud, nor too quiet. The iPhone 6 and iPhone 6 Plus stand out with their extremely stable videos. Details are plentiful, although we don't see as much of them as in the Note 4's videos. In darker environments, the two iPhones produce noisier videos, but retain their smoothness and lack of shakiness. Sound quality, however, leaves room for improvement. It is slightly muffled and lacking in loudness. Videos from the Samsung Galaxy Note 5 are smooth and have excellent details. But every tremble of your hand affects the footage noticeably, unless you manually turn on its software stabilization. At night, videos are still smooth, although noise is more prominent in darker areas. Sound in the S5's videos is very loud and clear. The LG G3 keeps the video frame steady with its optical image stabilization. Details in its videos, however, are not as finely captured as they are with Samsung's top phones. Night-time videos are smooth and usable despite the noise. Sound quality could have been better – audio is loud, but annoyingly digitized. The Samsung Galaxy Note 3 is still capable of taking quality videos despite being a year old. It may lack OIS, but captures plenty of details in its shots. Night videos have a tolerable amount of motion blur and noise. Also, audio is loud and clear. Videos from the Sony Xperia Z3 have excellent sound, but that's the only good thing about them. We noticed that its software image stabilization affects the footage's quality by adding unwanted pixelation. Detail quality is average at best and it gets even worse at night. Right from the start of this camera comparison, we were confident that the Galaxy Note 4 was not going to disappoint. Our expectations were correct, as it turned out. Samsung's phablet and its remarkable 16MP camera got the highest final score, and it is a well-deserved result, in our opinion. Samsung has done a great job at fine-tuning its 16MP sensor, which debuted in the Galaxy S5, to achieve even better image quality with the Note 4, with finer details and more accurate colors. Plus, having optical image stabilization makes a difference, especially when shooting video. The only area where we'd like to see further improvement is night-time photography. 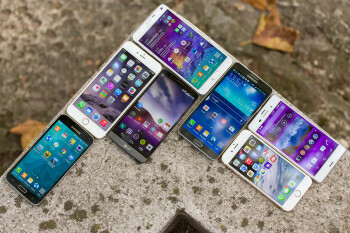 Close behind the Samsung Galaxy Note 4 rank the iPhone 6 and iPhone 6 Plus, standing in third and second place respectively. Apple's greatest phones yet serve as proof that you don't need a two-digit megapixel figure to take awesome photos. You just need a well-made camera with easy-to-use software. Sure, the iPhones' images can't match the detail produced by the Note 4's camera, but they score big points in lower-light photography. Also, the iPhone 6 and 6 Plus can be relied on when shooting at night or for taking videos. As for the Samsung Galaxy S5, it is a force to be reckoned with. Sure, it couldn't outrun the aforementioned high-ends, but it delivered commendable results most of the time. Its low light and night photos, however, leave room for improvement. Then there's the Samsung Galaxy Note 3 – a phone that performed well in our comparison despite being a year old. Under favorable conditions, it barely lags behind its competitors. 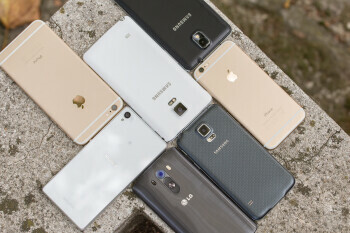 In low-light environments, however, the gap behind it and newer handsets becomes more obvious. 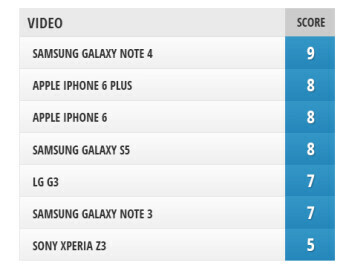 The LG G3 did't do bad, but its score put it in the unenviable sixth place. It is a “Jack of all trades, master of none” kind of device, as it gets the job done in any environment, but fails to excel in any of them. Still, it snaps pretty decent night photos, and its LED flash is a reliable one. Lastly, there's the Sony Xperia Z3. Its supposedly great camera turned out to be not so great against other leading phones, with poorer details, duller colors, and mediocre low-light performance. Is the phone's automatic mode to blame? We're not exactly sure, but whatever is holding Sony's cameraphone back, we hope to see it dealt with in the near future. The final score for each phone represents its average rating, but note that we're only taking into account the Details, Color representation and Indoor categories in the final score. We're factoring all the others (such as Night and Panorama) out, since those represent situations where users are less likely to take images in. Video recording isn't included either, since we consider it a separate thing from photo taking. We've done this in order to end up with a final rating that is representative of a camera's performance in those areas which we think are most important to users.